Despite the way securities traditionally are sold and what you hear in the media, the stock market confoundingly defies prediction. Look at the two quarters ended March 30th, 2019: The 19.8%t plunge in the Standard & Poor's 500 index in the fourth quarter of 2018 was a flash bear market; in the first quarter of 2019, a recovery was just as swift, a snapback gain of 13% gain. If whipsaw emotional shifts from fear to greed make it harder to stay realistic about what to expect from a prudently-designed retirement portfolio, this chart offers a way to know what to expect based on historical data. 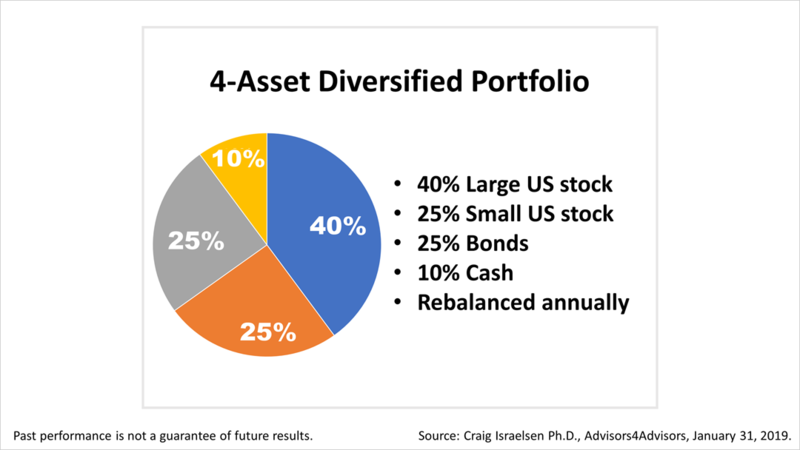 This chart shows the returns of four asset classes as well as a portfolio invested in a mix of the four. The returns are based on the average annual return of each asset in the 93 years from 1926 through 2018. Of the four assets, the best performing were large-company stocks, as measured by the Standard & Poor's 500 index, which averaged a total return of 9.9% annually over the 93 years. Each group of bars shows how often the four asset classes and the diversified portfolio achieved or bettered the long-term return of that particular asset class — 9.9% for large-cap US stock, 11.08% for small-cap US stock, 5.24% for US bonds, 3.39% for US cash, and 9.23% for a 4-asset portfolio — over rolling periods of five years versus 10, 15, 20, and 35 years. For example, large cap stocks gained 9.99% or more in 92% of the 59 35-year rolling calendar-year periods that occurred between 1926 and 2018. In comparison, the 9.99% return for large cap US stock was only achieved in 57% of the 89 rolling five years periods from 1926 through 2018. The longer holding periods are the tallest bars, showing that the longer your time horizon, the more likely you were to achieve a long-run return. Craig Israelsen, Ph.D., who compiled the data in this chart, has taught thousands of college students as well as financial professionals about low-expense portfolio design, says he would be the first to admit that what is happening now may not be your experience in the near future. But, over long periods of time, certain asset classes generally deliver their "mean" return. 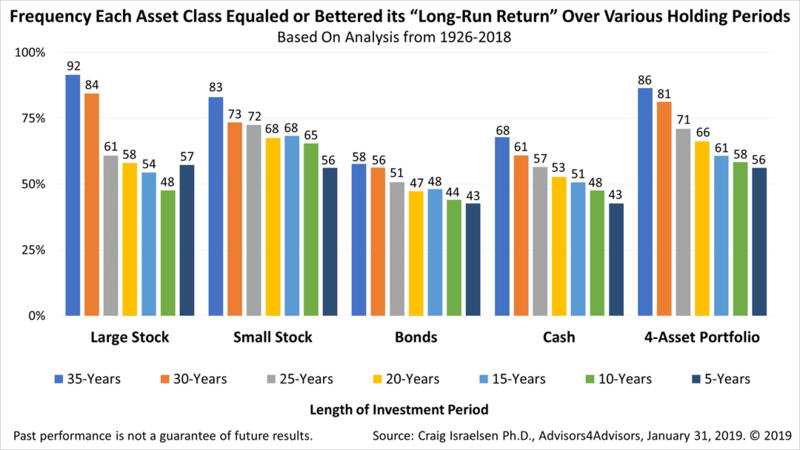 "Investors are reminded always that past performance is never a guarantee of your future results," says Craig Israelsen, Ph.D., who compiled the data in this chart. "Yet, having just been through an emotional whiplash, investors get important perspective in knowing a diversified 4-asset portfolio averaged a 9.23% return or higher in 86% of the 59 rolling 35-year periods from 1926 through 2018 with just 76% of the volatility of large-cap US stock." Performance of US Large Stock represented by S&P 500 Index (TR), US Small Stock represented by S&P Small Cap 600 Index (TR). US Bonds are represented by Barclays US Aggregate Bond Index TR USD, and Cash by USTREAS Stat US T-Bill 90 Day TR. Indices are unmanaged and not available for direct investment. Investments with higher return potential carry greater risk for loss. © 2019 Oxford Planning Group, LLC. All Rights Reserved. Oxford Planning Group, LLC is an experienced, fee-based Registered Investment Adviser (RIA) offering a full range of professional services, including Wealth Management, Financial Planning, Investment Management, Qualified Plan Consulting and more. PLEASE NOTE: The scope of any financial planning and/or consulting services to be provided depends upon the needs of the client and the terms of the engagement.